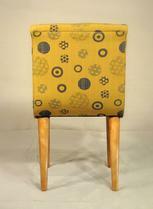 Upholstered armless occasional chairs, possibly part of the "Modern Mates" collection. 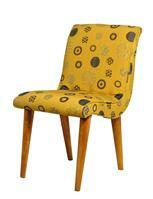 We've had prior examples of this chair before, as shown here in the yellow fabric. We currently have a set of six, which we're showing with a Robsjohn-Gibbings dining table. 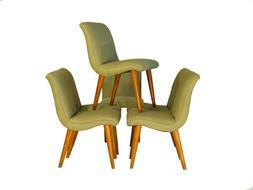 Four of these six chairs are in very usable vintage condition "as is," as shown in the green. Two chairs have stains (as shown in detail photo) and require re-covering for present usage. 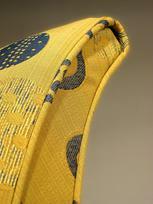 We have a supply of the yellow fabric, and are happy to supply the chairs either way. sold only in minimum of pairs.